The Green Fairy. La Fée Verte. To say that absinthe is legendary would be an understatement. Even those who don't imbibe have heard absinthe legends—it makes you hallucinate or cut off your ear or spiral into a green-tinged haze of madness. None of those are exactly true. But it's easy to see how the high, high-proof spirit could get such a reputation. Its alcohol content can be as much as 74 percent; the classic Pernod Absinthe is 68 percent. Meanwhile, its characteristic anise-fennel flavor distracts you from its mighty force. The mystique around absinthe grew thanks to its longtime ban in the United States; forbidden fruit always has a particular appeal. But since 2007, absinthe has been legal again, and the cocktail world is all the better for it. With such an iconic spirit, we don't feel the need to get complicated. Here are three classic ways to drink your absinthe—just don't try them all at once, s'il vous plaît. NOTE: In all these drinks, we're using the aforementioned Pernod Absinthe Supérieure, the oldest and most popular brand among the 19th-century Parisian set. Henri Louis-Pernod himself opened the absinthe distillery in 1805. Named for prodigious drinker Ernest Hemingway's 1932 novel, this cocktail goes down as easy as Champagne while camouflaging a full ounce of potent absinthe; a great pre-dinner sipper, it does carry a risk of, well, near death in the afternoon. We think it's a great choice for the novice absinthe drinker, highlighting all its prickly herbal flavors without coming on too strong. Instructions: Pour 1 ounce of absinthe into a Champagne flute and fill with sparkling wine (about 5 ounces). No garnish necessary. 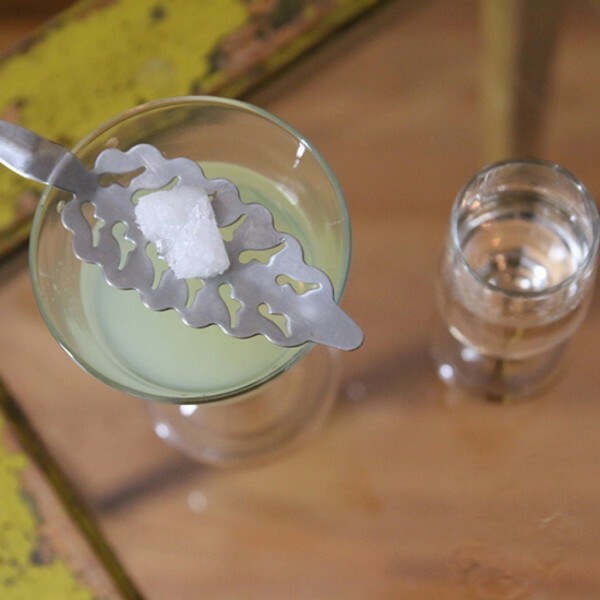 The traditional way to drink absinthe: just sugar, water and spirit. Like many other anise liqueurs, absinthe turns cloudy when it meets water, resulting in the eerie, opaque-green color you see here. You need a slotted absinthe spoon to really pull this off, and it's worth it—because anyone who owns their own absinthe spoon is automatically a baller. Instructions: Pour 1 ounce of absinthe into a small glass. Place the slotted spoon over the top and place a sugar cube on it. Slowly pour the water over the sugar cube into the glass below. While some classic cocktail genres have made a real comeback, the Fizz still languishes in relative obscurity. We'd like to see that change. Spirit, citrus, egg white and soda water come together for a light, frothy drink that's easy to love. Absinthe is a perfect fizz candidate—its intensity is tamed by the citrus and egg white, letting you appreciate the flavor without feeling like you got punched in the palate. But make no mistake: This is a drink that'll leave you feelingeven the first. Instructions: In a cocktail shaker without ice, combine 2 ounces absinthe, 1/2 ounce lemon juice, 1/2 ounce lime juice and 3/4 ounce simple syrup (equal parts sugar and hot water). Add one egg white. Shake all that up hard without ice. Add ice and shake again. Strain into a tall glass without ice. Top with 4 ounces of club soda.